Axiomet AX-160IP is a modern digital multimeter, with dual display and a touch panel. It is characterised by a wide range of features, and excellent ergonomics. Furthermore, it meets the requirements of high security and IP classes, in accordance with the standards of the European Union. The presented multimeter enables measurements of current and AC or DC voltage, resistance, frequency, capacity, temperature (-200 to +1000°C) of the point of contact of the probe, ambient temperature, as well as continuity tests of circuits, and reading of the results of current loops, expressed as a percentage. Additional features include automatic and manual range changes, automatic power off after defined idle time, display value hold, displaying minimum or maximum measured values, performing relative measurements, and memory of up to 10 measurement results. What is more, the multimeter communicates low battery and automatically adjusts display brightness using an embedded sensor. In the upper part, there is a dual 4-digit LCD display, with reading capacity up to 6000 counts. Below, a touch panel was installed, divided into two sections. The upper section refers to additional features of the multimeter, whereas the bottom one enables selection of measured values. Similarly to other multimeters, the bottom part includes sockets for connecting test leads. Thanks to the dual display, you have access to a lot of information at the same time. The reading of the currently measured value is displayed in large digits along with the information on the operating mode and selected units. Small digits at the top of the display can refer to maximum value, minimum value, a value loaded from the memory, or e.g. the number of readings saved in memory. In the top left corner of the touch panel, you can find a power button. Besides it, there’s a button for range selection, followed by buttons for relative measurements, loading readings from memory, and displaying maximum or minimum measured values. Below the latter one, you can find a hold button for freezing the current value on the screen, the SHIFT button giving you access to additional functions of the buttons, and a button for manual backlight adjustment. The remaining buttons allow you to select the type of values measured. 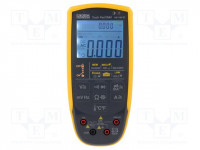 Due to the applied touch panel, the multimeter is operated in a slightly different manner than the models with a control knob. To turn the device on, you need to swipe your finger down in the power button area. To turn it off, quickly swipe up twice in the same area. The meter is set to automatically adjust the measurement range by default. If you want to manually select the range while taking voltage, current or resistance measurements, press the "RANGE" button once, and then use the up and down directional buttons to select range. Press the "RANGE" button again to force that range. Meter display becomes red if the measured value exceeds selected measurement range. Touch the "MAX/MIN" button once while taking measurements to display the maximum measurement taken. Touch the button again to show the minimum measurement taken on the sub-display. Touch the button one more time to turn off this mode. If you want to hold the current reading, just touch the "HOLD" button. This area of the touch panel can also be used to switch the multimeter to the "Transfer data to PC" mode, if you touch the "SHIFT" button right before using it. This activates the "LINK" button's function. To use memory mode, touch the "SHIFT" button, and then touch the "MEM" button. Each subsequent touch of the "HOLD" button will store the current reading in the device's memory. You can save up to 10 records this way. Touch the "MEM" button again to turn off the memory function. You can view or delete saved data. To load data from memory, touch the "SHIFT" button, and then touch the "RECL" button. Use the directional buttons to navigate through saved results. To delete all saved data, touch the "SHIFT" button, and then touch the "Param" button. Letters "clr" will appear on the display. Touch the "RECL" button. A "yes" symbol will appear for 2 seconds. Then, all data will be deleted. Taking measurements of current loops is also very easy to do. All you have to do is touch the "mA" button three times, and then touch the "RANGE" button once. The next step is selecting a measurement range, i.e. selecting the loop type. You can make your selection with the up and down directional buttons. 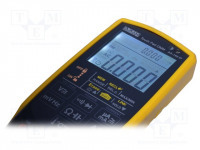 This multimeter not only features a powerful set of functionalities, but is also very accurate. All voltage and alternating current readings are True RMS values, since the meter takes RMS measurements. This meter also complies with the EN61010 standard for CAT III 1000V and CAT IV 600V, making it excellent for professionals. It is also worth mentioning that its enclosure complies with IP65 protection class, which means it is fully dust-tight and protected against water projected from a nozzle. 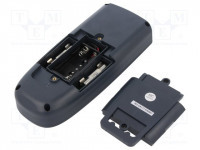 The device is powered by two LR6 (AA) batteries. Test leads and a K-type probe for measuring temperature are included with the meter.